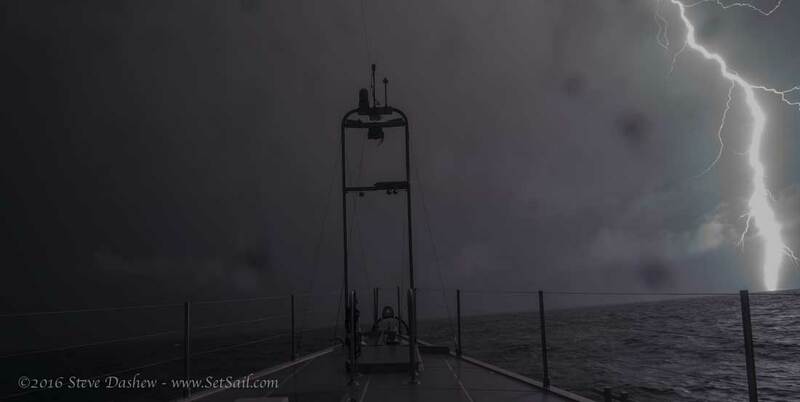 For those of you wondering if it is worth the hassle of bonding the metal on your fiberglass yacht, we offer a series of photos from one squall in the Gulf of Panama. The outside photos are shot with a 24mm lens. The same with the interior shots from aft through the starboard side. Shots forward are a second camera with a 20mm lens. These are about a third of the photos taken over a couple of hours. The thickness of the central portion of the bolt is vaporized water. When looking at this shot, keep in mind that a 20mm lens makes things look a lot further away. This was a very close strike, way too close for comfort. 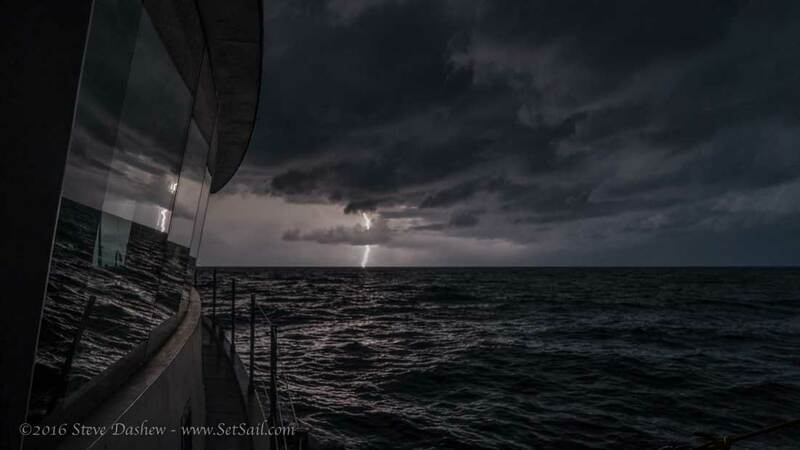 With the intensity of the light – this photo has been darkened by almost 300% – it looks to us like this was a very close strike. In tis photo there is a brown haze that appears across the bottom. Most has been cropped out, and we have no idea what caused this. Technical data: Sony 7R2 bodies, Sigma 20mm F1.4 and Sony 24-70 F2.8 lens. Both cameras had Steppingstone Lightning triggers. Settings varied, but shutter speed remained 1/15th of a second due to motion of the boat. On land shutter speed would have been 10 to 20 seconds. This entry was posted on Tuesday, November 22nd, 2016 at 4:27 am and is filed under Dashew Logs, FPB 78, The Logs. Both comments and pings are currently closed. Does the boat act like a Faraday cage around you guys? How dangerous is it really? What, if anything, do you do to prepare for storms like that? Yes Gene, Cochise’ metal hull is a giant Faraday cage. We carry spare electronics in a drawer away from wiring, use twisted pairk wiring, and have several antenna that have plugs at their bottoms and provision for those to attach to a ground plug. 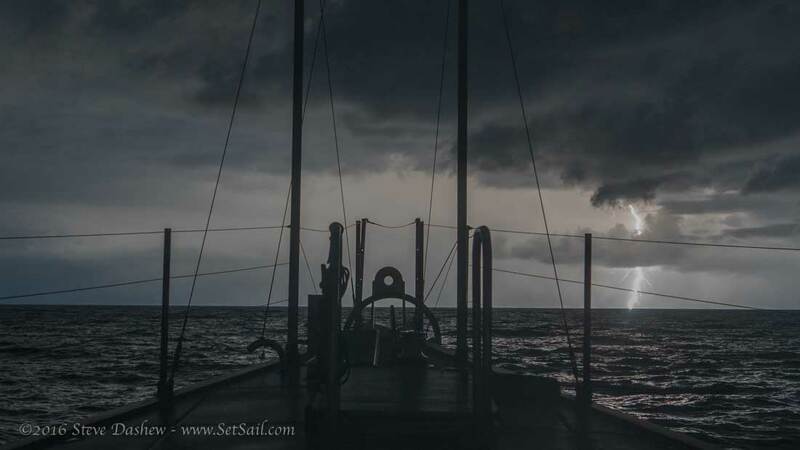 I am curious to know what you think the consequences would be of a direct hit on your boat. I am sure you have contingency plans. Congratulations on another great boat and great passage. There is no way to predict the consequences of a direct strike as this depends on the magnitude of the bolt and the direction it takes. What we do know, or think we know, is that the metal a hull acts as a Faraday cage giving the hull a degree of protection. Using twisted electrical cable as opposed to parallel lay reduces potential problems too. 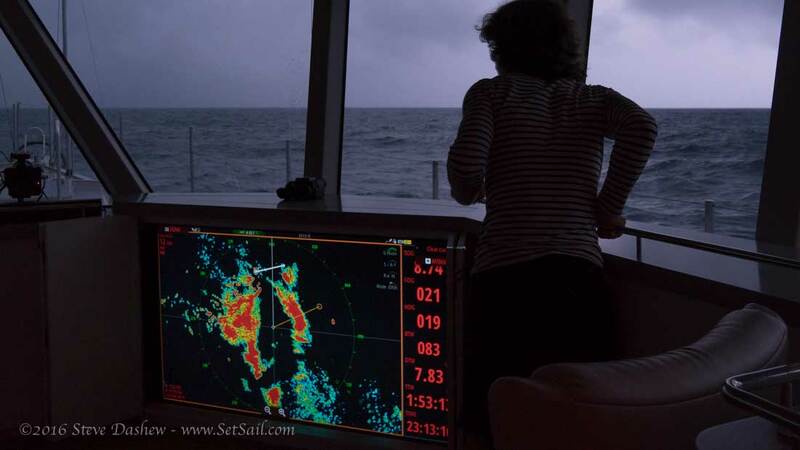 We carry a spare auto pilot, spare engine CPU, and spare Simrad navigation black box, all disconnected and stored along with other electronics geqr in a bunk drawer. No idea what a direct hit would do and do not want to find out! When you say “too close for comfort” you really aren’t kidding. Those strikes are awfully close when seen through 20/24mm full frame lenses. 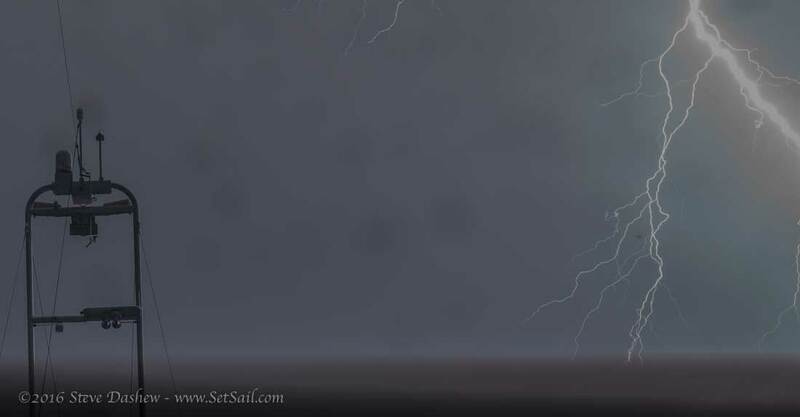 I have worked as an Electrician for 50 years and have witnessed many lightning strikes over those years. Every strike that I have seen and the damage it has done proved to me that it will always try to travel in a straight line. I have thought that if a lightning conductor was fitted to a boat it would be a good preventative measure. 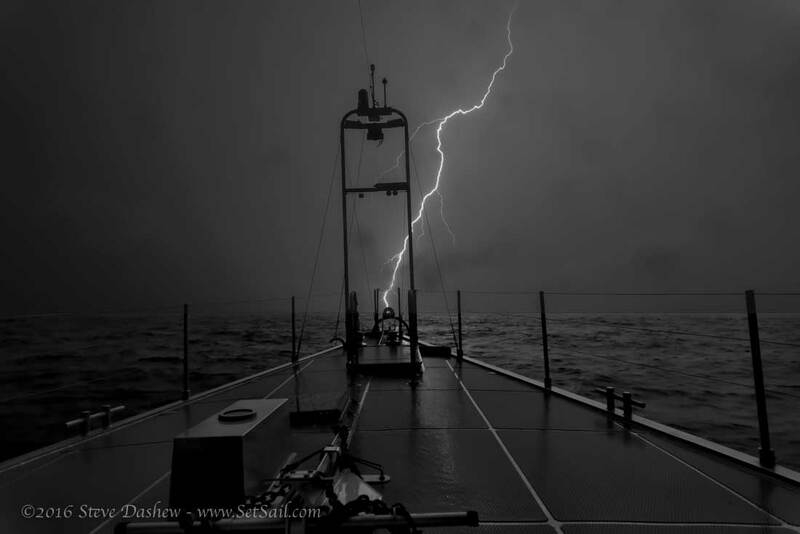 I would like to see a dome shaped lightning collector fitted to the top of a lightning rod that should be no smaller than 70mmsq and must be the highest point of the boat and must run straight into the water. wow… impressive photos indeed. 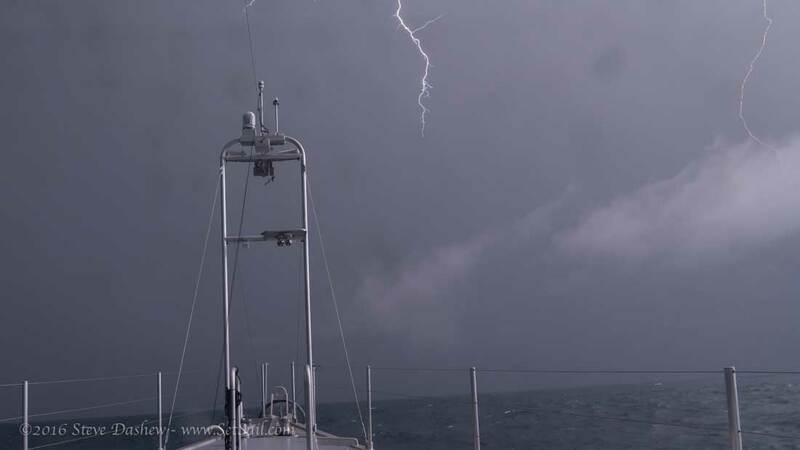 Depending on the number of electrical hull penetrations and antennas outside the faraday cage (from the photos one can tell that it is actually quite a lot) it may be an option to fit a boat with lightning protectors (e.g. http://www.hubersuhner.com/en/lightningprotection – no I am not affiliated in any way, this is just for Illustration). I wonder if you have ever tried these on one of your boats? But then of course, as you correctly point out above, there is no telling if a particular protector will be sufficient for a particular lightning strike. 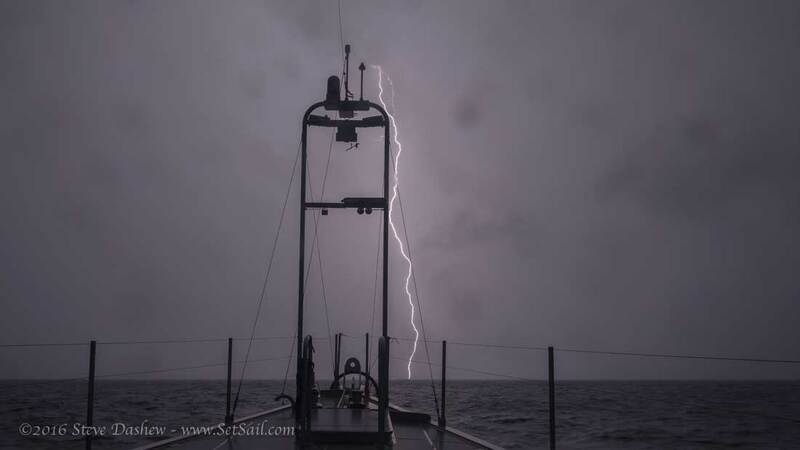 For a land Installation, lightning is much more predictable than for a yacht, especially one that is built to ply all oceans = all climates and weather zones. This is just guessing, but Re: the brown haze across the bottom of the image – if it was exactly horizontal in the image (I cannot quite tell above), it may well be an effect of the lightning’s EMP (electromagnetic pulse) on the camera electronics. Have no experience with these. 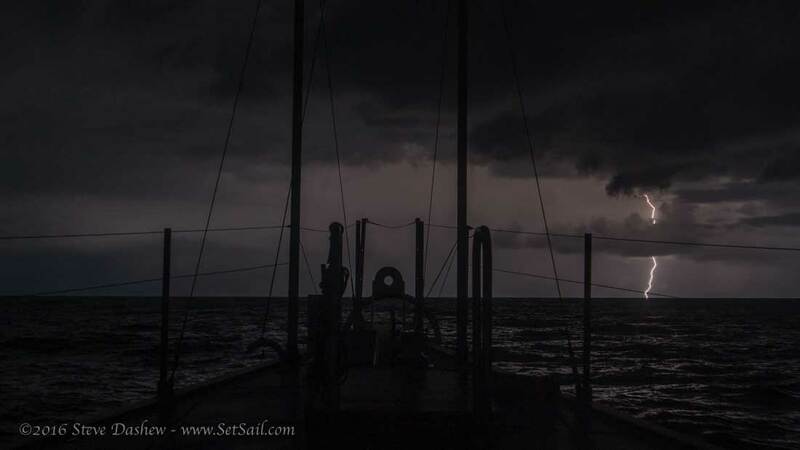 Do you, or any other SetSailors? Would love some feedback. Hi Steve – unfortunately I cannot contribute direct experience. 20 years ago I worked in this field for a while. Most such protectors were or are deduced from such that were originally developed for the military. After the ‘Starfish Prime’ Experiment in 1962 (see https://en.wikipedia.org/wiki/Starfish_Prime), the effects of electromagnetic pulses generated by nuclear explosions – and also by lightning – were better understood. Most such protective devices are intended to protect against EMP (electromagnetic pulses) rather than against direct hits, I believe. 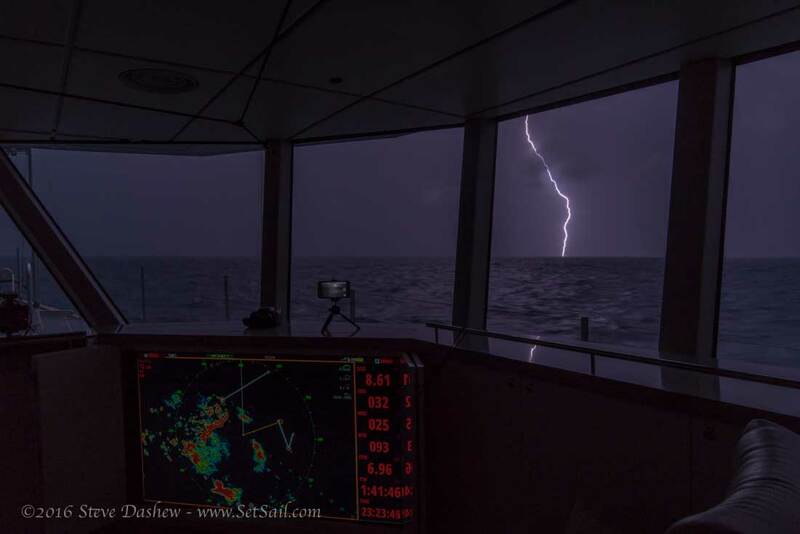 However this is also the typical failure mode for antenna installations: A lightning strike requires a serious conductive path into ground (= the sea, in our case). 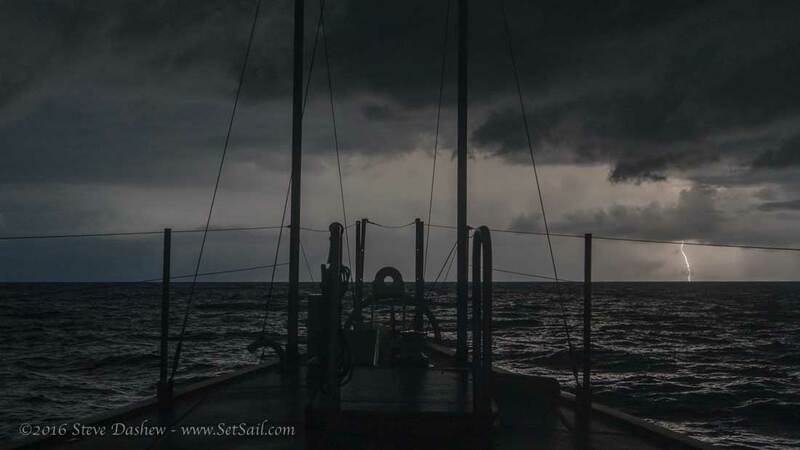 Antennas and antenna cables are a joke from a lightning’s perspective, so the lightning current will blow through the mast or the boat’s surface instead. 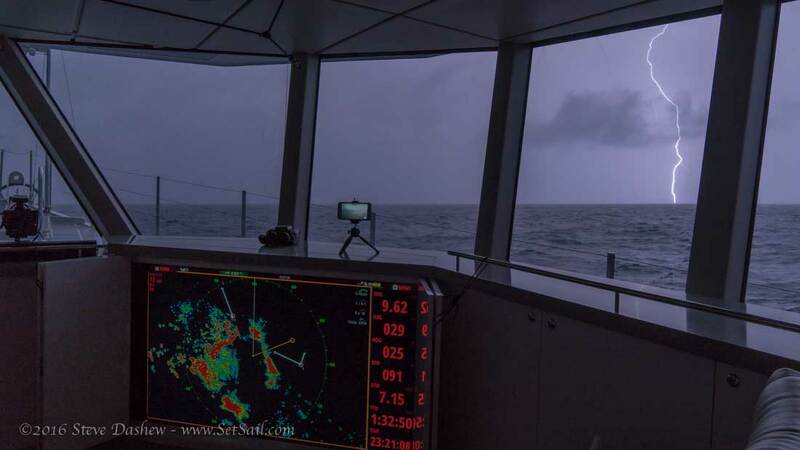 However, the current of the lightning in the mast or boat surface will generate secondary, induced currents in antennas and antenna cables. These are still strong enough to fry your electronics, and these are what “lightning protectors” actually protect against.